As early as January 20, 2019, a new traffic configuration will be implemented at Forest Hill Station. 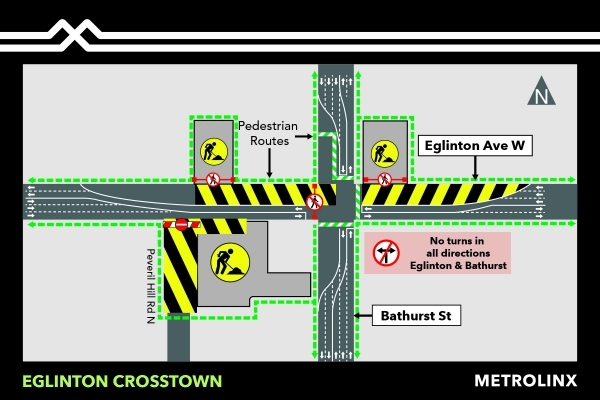 Traffic on Bathurst Street will be shifted to the east side, and traffic on Eglinton Avenue will remain on the south. This configuration will be in place for approximately three weeks until early February 2019. Pile installation, excavation and utilities work will continue through winter 2019. This traffic change will be implemented overnight, when traffic is lighter, to minimize the impact to TTC operations and the travelling public. Please note that the one-block closure of Bathurst Street from Eglinton Avenue to Wembley Road, is no longer being pursued. Instead, crews will conduct a series of traffic configuration changes over 2019, maintain one lane of traffic in each direction at Bathurst Street and Eglinton Avenue. Four weekend intersection closures will be required over 2019 to facilitate roof construction and traffic bridge installation and removal.